Maryland is home to some of the most lengthy, picturesque and distinct trails in the country. Regardless of where you choose to do your Deep Creek Lake Hiking, you’ll find a trail that suits you. When it comes to deciding where to start, you might become slightly overwhelmed, but don’t worry! We are here to help! Deep Creek Lake hiking trails are perfect for enjoying the great outdoors. Come stay with us at Lake Pointe Inn and start your adventure! Here is a guide to some of our favorite trails! 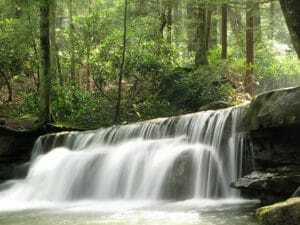 Go ahead and begin with a hike at Swallow Falls State Park. Hiking at this state park will allow you to see a few waterfalls, including Muddy Creek Falls – Maryland’s highest waterfall at 53 feet high! You will also be able to see the Youghiogheny River and Muddy Creek, both of which are white water rivers. These waters can become dangerous, so make sure you use extreme caution when hiking in this area. From Swallow Falls State Park, you can also get all the way to Herrington Manor State Park. The 5.5-mile trail from Swallow Falls to Herrington Manor will guide you through the beautiful Garrett State Forest. Savage River State Forest also provides guests at Lake Pointe Inn an awesome place in which to find some great hiking trails, particularly those folks looking for an extreme challenge. Meadow Mountain Trail, Big Savage Trail, and Backpacker Loop are all 12 miles or more in length. Meadow Mountain trail is a moderate hike that covers 12 miles, while there is a 4-mile section for off-road vehicles if you want to spice up your adventure. Big Savage Trail is a difficult hike that spans 17 miles. Because of the strenuous conditions, hikers are required to call the office at 301-895-5759 and should pack plenty of water before embarking on their journey. The Backpacker Loop is 24 miles and meant for a multiple-day excursion. You’ll enjoy the hike, but be sure to pick up a backcountry permit at the office prior to your start. For those willing to drive just a bit to find a great trail, Blackwater Falls State Park, Dolly Sods, and Coopers Rock State Forest are all across the state line into West Virginia. Driving to any of those three would make a perfect day trip with your home base remaining at Lake Pointe Inn! Once you complete your Deep Creek Lake hiking experience, staying at Lake Pointe Inn is a must so you can kick up your tired feet and relax. Our luxurious rooms are all decorated in the classic country style, which complements the beauty of the countryside. In addition, our stay includes a complimentary breakfast each morning so you’ll be ready to hit the trails. Nothing beats sitting in a rocking chair on our covered porch after a long, but exciting day of traversing the Deep Creek Lake hiking trails! If you come to Lake Pointe Inn to experience the beautiful scenery in our area, we’re sure that the Deep Creek Lake hiking trails will become some of your favorite to explore! See you soon!